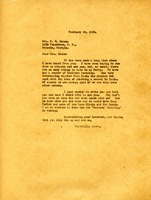 Martha Berry writes to Mrs. F. M. Inman to request that she visit Berry in the next week so that they may talk over plans about the Mothers' Building. 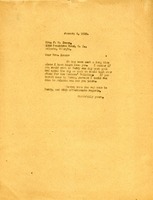 Berry asks Hammond to write to say that although she appreciates the interest Mrs. Tener has taken, she should not approach the Fords in any way, as Mr. Hoge and Mr. Keown agree that all requests should come from Berry. Ground has been broken for the Mothers' Building. Although they lack sufficient funds to finish the building, Berry hopes it will "come out all right". Inman is back at her desk after a year's delay in working on the Mothers' Building. 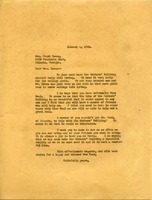 She sends instruction to Bessie Bonner about a Berry exhibit in Atlanta, asking her to prepare "all things beautiful" and made at Berry, and to include the Girls' Quartet as entertainment. Inman is concerned that the attention of potential supporters in Atlanta will be diverted to the Rabun Gap school. Miss Berry writes Mrs. Inman about the recent visitor from India and asks her to visit soon. Miss Berry has just gotten over a bronchial cough and has missed her appointment with Mr. Penny due to her illness. 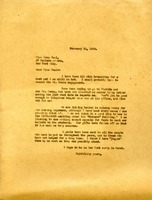 She informs Miss Neal of this and then notes that she will be in New York on the 4th- pressing that she would like Miss Neal to attend the engagement, held at Mr. Jones' Office, on the 5th of March. Miss Berry believes that together they, alongside Inez Wooton, will be able to raise money and get Trustees for the school. Miss Martha Berry has become ill with bronchitis and will probably have to cancel her St. Louis engagement. She inquires about when she is to meet Mr. Penny again as she has not yet received an answer for when he expects her. Furthermore, Miss Berry writes that the school is falling behind in raising money for their running expenses, and she has already used every means she can think of to raise funds. 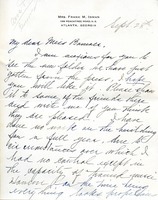 Miss Berry tells Mrs. Inman that she is sad because she has had to break engagements that would have meant money for Berry because of her health. She also explains that she's going to New York in March but needs Inez Wooten to go to with her because she isn't strong enough to go alone. She asks Mrs. Inman to go to Augusta as soon as possible so she can set up the exhibit at the Bon-Air. She tells Mrs. Inman to let her know if she needs Inez. Miss Berry also notes that she thinks it's better to have less publicity in Atlanta so others don't try to do the same things Berry is doing. 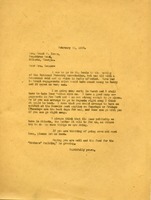 letter to Mrs. Frank Inman from Martha Berry concerning the idea of the Mothers' Building and the donations needed to build it. She informs Mrs. Inman that they need the Mothers' Building in order to house the increasing number of girls that wish to attend the Berry Schools and to reduce the crowding that was already present in the girls dormitories. Miss Berry asks if Mrs. Inman can write Miss Neal and Mr. Beck to help with the building because she believes it is a beautiful idea. She also informs Mrs. Inman that she wishes her to come to the schools as often as she can for a visit. 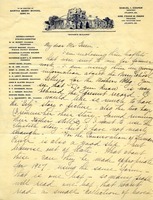 Martha writes to Mr. Martin to thank him for his subscription towards the Mothers' Building. Inman asks for new leaflets to accompany her solicitation for the Mother's Building. 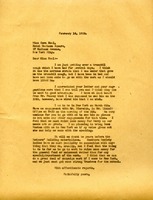 She gives examples of previously done materials that she wishes to have "made appropriate for 1927" and urges Green to move quickly to develop something that will be appealing through the mail. Written on Mother's Building stationery.